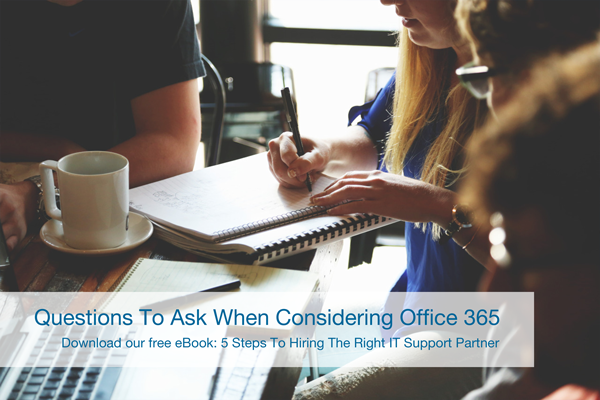 Before you decide to switch your business to Office 365, be sure you meet with your IT partner first to iron out the details. Making a move to the cloud will be one of the best decisions you can make and will have the most obvious impact on how your team works. However, if you’re not careful, moving to the cloud can easily cost you more than you hoped and seriously eat away your budget. Before we get into the questions you’ll want to ask, let’s go over a few basics about the cloud and the difference between purchasing Microsoft Office as a product, and Office 365 software-as-a-service (SaaS). What’s The Difference Between Microsoft Office and Office 365? The Microsoft Office you’ve come to know and love is now offered in a new way known as software-as-a-service. Basically, Microsoft has bundled their software into a package (word, excel, power point, outlook, etc.) and have added other cloud utilities into a cloud subscription model. Microsoft is now charging monthly per user fees based on how you intend on using their software. The fee per user / per month is pretty reasonable considering the convenience factor and many other perks and convenience you get with cloud computing. The best part about Office 365 is that you’ll always have the latest Office products so you’ll never need to worry about losing a CD, or having to buy new software. Simply pay your bill, work smarter, faster, and more efficient using the cloud. Checkout this recent post to learn more about cloud services for small businesses. Traditionally in the past, when you needed Office on your PC you would purchase the software, install the product, and hang on to the software for the life of your system – sometimes extending beyond that. You would pay a few hundred dollars depending on the suite you purchased and specific need you had for Office. Technically, the software is still licensed that way and though you paid for the software, you still don’t own it – just read the terms and conditions (thanks Bill!). So, in a nutshell, you own a license number that you lease to install and use as you please. Within Microsoft’s strict terms and conditions though. Is Microsoft Office or Office 365 more cost-effective for my business? How long will the migration process take to move to Office 365 and will I experience any downtime? Will you provide Office 365 training and support to my team? What other cloud services are offered by Microsoft that I should consider? Have you performed any recent Office 365 migrations recently and was your client satisfied? What should I expect the total monthly cost for Office 365 to be? If I purchase Office 365 today, how soon will the migration and implementation be? When consulting with your IT partner, be sure to discuss all of your concerns so that they’re noted and addressed. It’s okay to ask questions, ask plenty of them! Have a clear understanding of the risk and great reward with moving your business into the cloud. If you’re looking for an IT partner in Austin with extensive knowledge and experience in delivering custom Office 365 cloud solutions than give us a call! We’re happy to help move your business into the cloud.